Vector Unit featured on Gamasutra! We got an awesome write-up titled, "How small-scale studio Vector Unit optimized for big-scale success." Riptide GP2 Is Out and the Votes are In! 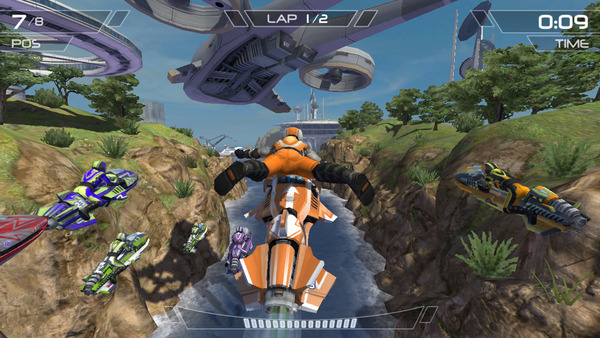 Vector Unit's latest game Riptide GP2 has been released for both iOS and Android. The team here is excited, relieved, and really gratified that the customer reception has been so great. As of this writing the average reviews on both platforms are hovering somewhere around 4.75/5. Thanks everyone! In addition, the critical reviews have been great! Riptide GP2 is an excellent water racer that looks as good as it plays. With online multiplayer, upgrades, and several tracks on different worlds, it has a ton of replay value. Riptide GP was a great game... the improvements and additions made by Vector Unit have turned Riptide GP2 into a full-fledged excellent racing game. Riptide GP2 is...a fantastic upgrade over Riptide GP and is worthy of its asking price. It'll keep players entertained for hours while splashing around tracks, pulling off mega stunts, and earning enough money and upgrades to improve their ride. Thanks to everyone for supporting our new game! See you online! At GDC last month Gamerlivetv conducted an interview with Vector Unit's Creative Director Matt Small about Riptide GP2. Here's the video! We cover tons of information about the game, including the new career mode, multiplayer, and more. Check it out, and let us know if you have any more questions of your own we can answer! Here's a sweet video of Riptide GP2 running on Project Shield. One thing the guy doesn't mention is that the whole game is being rendered with real time shadows, which you can see when the rider casts a shadow on the hydro jet during the stunts. Blimey! We're on the BBC! BBC reporter Marc Cieslak covers the latest phones coming out at Mobile World Congress. Yeah, that's cool. But even cooler is how, along the way, he shows both Riptide GP and Shine Runner as examples of "graphically gorgeous gaming". Dialect has just launched NVision magazine, a slick new Android digital magazine app that features in-depth articles and interviews about games, technology, movies, and a lot more. In its first issue, there's a feature story about next-gen tablet development that features interviews with Matt Small and Ralf Knoesel of Vector Unit, alongside some other developers you may recognize. Definitely recommend checking it out -- not only because we're in it, but because the articles and production values are really top-notch. And despite what you might think, it's not just a big ad for Nvidia products, and you don't need an Nvidia tablet to run it. There's really a lot of good stuff in there. Plus it has a really sweet 3D interface. Download it here from the Android Market -- excuse me, "Google Play". A while back we had a little chat with Verizon about featuring some Riptide GP footage on Telemundo's popular telenovela "Una Maid En Manhattan". We said, "Sure!" and signed some release forms and didn't hear much else about it. Gaming Uberblog Kotaku today singled out Shine Runner as their Gaming App of the Day! The racing portion of the game is simply gorgeous, running blazingly fast on my Samsung Galaxy S II and featuring a graphics slider to tone down the visuals for lesser models. Like Riptide GP before it, this is one of those games that highlights how powerful mobile gaming has become, at least from a technical standpoint. That kind of talk makes the bubbles bubble faster. Thanks Kotaku! Vector Unit's Creative Director Matt Small shares his thoughts on what it takes to make the switch from console to mobile development, in this Riptide GP Postmortem on Gamasutra. The problem as always with a very small team -- in our case, a very, very small team -- is that there is virtually no wiggle room for unforeseen variables. We went from three week Scrum sprints at the start of the project, to two week sprints, to one week, and towards the very end we tossed Scrum completely and just went with prioritized task lists, squeezing as much as we could into the time we had. As hard as it was, it was creative, rewarding work, and somehow we managed to get it all done on time. But the process wasn't always pretty. Check out the full article on Gamasutra for insights on pipeline efficiency, alternative business models, piracy, and more!